Look, I was doing OK. I got through the oil spill on the road that is turning forty. Lost a little control, but I drove into the skid just like the driving instructors tell you to and afterwards things were fine again, no, really, they were better than fine. Kate Reddy had it all: a nice home, two adorable kids, a good husband. Then her kids became teenagers (read: monsters). Richard, her husband, quit his job, taking up bicycling and therapeutic counseling: drinking green potions, dressing head to toe in Lycra, and spending his time—and their money—on his own therapy. Since Richard no longer sees a regular income as part of the path to enlightenment, it’s left to Kate to go back to work. Companies aren’t necessarily keen on hiring 49-year-old mothers, so Kate does what she must: knocks a few years off her age, hires a trainer, joins a Women Returners group, and prepares a new resume that has a shot at a literary prize for experimental fiction. When Kate manages to secure a job at the very hedge fund she founded, she finds herself in an impossible juggling act: proving herself (again) at work, dealing with teen drama, and trying to look after increasingly frail parents as the clock keeps ticking toward her 50th birthday. Then, of course, an old flame shows up out of the blue, and Kate finds herself facing off with everyone from Russian mobsters to a literal stallion. Surely it will all work out in the end. After all, how hard can it be? Hilarious and poignant, How Hard Can It Be? brings us the new adventures of Kate Reddy, the beleaguered heroine of Allison Pearson's groundbreaking New York Times bestseller I Don't Know How She Does It. 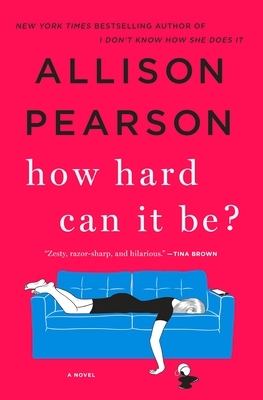 Allison Pearson is the author of the hugely bestselling I Don't Know How She Does It, now a major motion picture starring Sarah Jessica Parker, and I Think I Love You. Pearson was named Newcomer of the Year at the British Book Awards in 2002 for her first book. She has written for The Daily Telegraph, The Times (UK), The Daily Mail, Time, The New York Times, The New Yorker, The Observer and countless other publications. Pearson has won many awards including Columnist of the Year, Critic of the Year and Interviewer of the Year.